This is a great recipe to enjoy summer and to use green tomatoes that you can pick up from the Farmer's Market. I adapted this recipe from Martha Stewart Living Cookbook-The New Classics. I added some fresh spinach for added color. Add hot sauce for an added kick. 1. Cook the veggie bacon in a skillet until crisp. Set aside. 2. In a shallow dish, mix together the cornmeal, salt, cayenne pepper, and sugar. Add the tomatoes, and toss to coat. 3. Heat the vegetable oil in the skillet over medium heat; add the tomatoes, and fry until golden, about 2 minutes per side. 4. Spread the vegan mayonnaise over the cut sides of biscuits; fill each side with 1 to 2 slices fried tomatoes, 1 slice of veggie bacon and cheese, and add spinach. Sprinkle with hot sauce, if desired. Enjoy. 1. Preheat the oven to 400 degrees F. Whisk together the vinegar, lemon juice, 1 Tbs. oil, and 1 tsp. each thyme and oregano in a small bowl; set vinaigrette aside. 2. Lightly coat a large rimmed baking sheet with cooking spray. In a large bowl toss eggplant, zucchini, onion and remaining 2 tsp. each thyme and oregano. Spread in a single layer on prepared baking sheet. Drizzle with remaining 2 Tbs. oil. Roast, tossing occasionally, until golden, 30 to 35 minutes. Let cool slightly. 3. Transfer vegetable mixture to a large bowl. Add chickpeas, tomatoes, pepper. Drizzle with vinaigrette; toss to coat. Arrange mozzarella in center of lavish pieces or wraps. Top each with 1 1/4 cups vegetable salad. Roll up; cut in half. This image is copyright © 2007-2010, Rudis Muiznieks. For more humorous commentary in this vein visit Cectic. Can you learn to love the rod on your faucet that saves water? 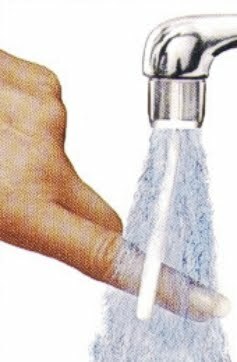 All over the net you can read the claim that 80% of water used to wash hands, brush teeth and shave goes down the drain. While the amount wasted this way is dwarfed by the amount wasted on carpet grass, the amount is significant enough that restrooms in commercial facilities all over our region use automatic sensor faucets. These automatic faucets require power and a change in fixtures. The fixtures can cost hundreds of dollars. But there is a mechanical alternative for less than $20 per faucet. The Smart Faucet and Automatic Faucet Control feature a replacement for the screw in aerator which all modern US faucets have. A rod extends from the replacement aerator. The valves on the faucet are set open. When the rod on the aerator is pushed, water is released. When pressure on the rod is removed the water stops. While the devices look unusual and have not been designed with beauty in mind, the low cost and water savings may let you learn to love them. In addition to saving water the devices prevent cross contamination and make it faster and easier to wash up. It also benefits those with grasping, twisting, turning and gripping difficulties. Because the devices allow the faucet valves to be left in an on position the sellers claim that the faucet valves will last longer. 3. Meanwhile, toss together tomatoes, onion, basil, olives, vinegar, oil, salt and pepper. Serve over tofu. NPR aired a story entitled "Do it yourself Downsizing" which featured Derek "Deek" Diedrickson on June 27, 2010. Deek is a tiny structure builder, designer, enthusiast and promoter. His creations feature lots of free cycled materials and clever designs. His website is Relaxed Shacks aka relaxshax.wordpress.com. He has an independently published book out entitled Humble Homes, Simple Shacks, Ramshackle Retreats, Funky Forts (and whatever the heck else we could squeeze in here), which has the hand drawn look and feel of pre-desktop publishing hippie how to books of the 1970's. The plastic binding is a nice period touch. Thus far he's completed three episodes of his web series "Little Yellow House". Thanks to the miracle of embedding here are all three. Episode One focuses on Deek's Hickshaw, a one person sleeper, green house or office that can be moved by one person or hauled in the bed of a truck. Episode Two examines his Gypsy Junker made from material discarded at construction sites and other places. It sleeps 3 but you have to really like each other. He doesn't have the style of recycling style or interest in fine finish work of Dan Phillips but his enthusiasm is infectious. I couldn't imagine building a Tumbleweed house myself but something like this is possible. Episode Three is less about tiny houses and more about the music in the Gypsy Junker and Deek advocating the use of a drum as a multi-purpose piece of furniture. What is getting the hits and why in the world of San Antonio Sustainable Living? From time to time I update our list of most popular posts. I just did today so just for grins I decided to compile the list in one posting and engage in a little speculation. As a group the Meatless Monday recipe's that JM Fonseca has added consistently to the blog are the most most read posts. She tests the recipes herself and unlike some vegetarians she seems to enjoy dishes that are also enjoyable to people with more omnivorous diets. Meatless Monday is a worldwide meme that is inviting non-vegetarians to include vegetarian dishes. Topping the list as of today as an individual posting is the notice about a tiny house on a trailer that is for sale in San Antonio and has been for quite a few months. Because it was mentioned by very popular Tiny House Living it has received over 300 hits, which is quite a few for this blog. This item was first posted in October 2009. Since October 2009 the story on the Larry Williamson's long compressed earth block machine has continued to reside in the blog's top ten. I didn't have any new information on it or photos on the machine but I recall that finding the material on it was difficult, so perhaps the verbiage in the story causes it to rise in search results above the places where the information was originally found. Stephen Colley's notice on the 2010 Tierra y Cal compressed earth workshop got a lot of hits, perhaps because it was linked to by several other sites including our big sister, Austin's Design Build Live as well as a couple of other sites. Our story with a few links and an embeddable video about Dan Phillips Phoenix Connection from April 2009 continues to get hits. It spikes whenever he gets big publicity. I searched and watched quite a few videos about his work and the one here is my favorite. A little post from April 2010 in which I sorted through a couple of hundred results from Instructables.com to find what I thought were the best ideas for DIY Compost bins has been very popular. A similar story on DIY water level ideas has sprung into our top 10 recently. This picture of the Honeywell branded home windmill has been popular since it was posted in September 2009 but it is mentioned and linked to by one discussion of the windmill. Perhaps it also comes up in certain image searches. A story on a Texas made chicken tractor continues to get hits, though their website is easily accessible. I am not sure what value added our posting has which brings in the viewers. The story “How to Build a Bamboo Star Dome” has been popular since it was posted in August of 2009. The pages it links to were low in google results and the fact that there are instructions in a rough form of English is not immediately clear when you go to their site which is why I think people find our story. DIY domes stories have been consistent hit magnets. If we were a commercial site I would include a million of them. Our September 2009 post on an Organic Shrimp Farm in west Texas continues to be popular. Our post mainly serves up links to original coverage of the farm in other publications. I worked long and hard on our April 2010 story on Sologen Systems. I wanted to give an idea of how much potential their work has while not making extravagant promises or predictions. Sologen hasn't been seeking a great deal of publicity other than sending out one press release. Our story is or was for a long time the only post that went beyond just reprinting or excerpting their press release. It continues to garner a modest number of views. If their work bears fruit I'm sure information on their systems and the implications for the energy industry will be all over the mainstream. A December 2009 story that brought together information from several sources on phase change materials has suddenly begun receiving a number of hits. I'm not sure why it became popular. I think depending on the development of building materials that it will become a subject of immense importance. That's the review for now. I think it is interesting to me to see how topics rise and fall. Just like the San Antonio Sustainable Living group, this blog exists just to put information out there for the person who is seeking it. Take what you like and leave the rest. If you live in a designated historic neighborhood that does not allow efficient replacement windows or allows only extremely costly and high maintenance wood frame replacement windows you may want to look at wood window restoration. Increasingly individual crafts people and companies are appearing that specialize in window restoration. Fans of historic preservation and the boards that enforce preservation decrees are more and more making the argument that window restoration is less costly and better for the planet than window replacement. Though they do not compare the costs of replacing wood framed windows with modern metal, plastic and fiberglass framed windows, repair is certainly less expensive up front than installing a modern wood framed window. The argument can also be made that the pollution caused by excessive energy consumption due to historic windows is made up for by the aesthetic appeal of such windows. Below is a collection of embeddable presentations on the subject. The Old House Web has a video "Old Windows are Green". The presenter notes that with storm windows installed the restored windows will be much more comfortable. Of course you'd have to check to see if your historic board allows exterior storm windows. This video from Austin's Red River Restorations touts the higher quality materials in historic windows and suggests that the charm of historic windows make not replacing them a green decision. Fine Homebuilding Magazine posted their March 11, 2010 illustrated guide "Should Your Old Wood Windows Be Saved?" online. It provides fairly authoritative information and suggestions. Restoration Works Inc in Chicago makes their case for window restoration being green in this web page. The arguments they make are generally applicable to any window restorer. This engaging video from the WWF starts with noting the amount of water used to produce a cup of latte and goes onto encourage optimistic thinking and action to reduce the use of earth's resources. Fresh mint adds a cool, light touch to this hearty eggplant stir-fry. Heat oil in wok or large skillet over high heat. Add eggplant and onion; stir-fry 10 minutes, or until eggplant is browned. Stir in tomatoes, brown sugar, soy sauce, lime juice, and chile-garlic sauce. Cook 3 minutes more. Add bean sprouts and bamboo shoots; stir-fry 2 minutes. Garnish with fresh mint. We may not know how far it is across the Gulf of Mexico but we do have a decent idea in San Antonio just how far it is to Austin. The site "If it was my home" imposes the current spread of oil from the BP disaster on a Google map. You can move the spill to any area on the map. Since I'm writing from San Antonio, the site configured itself to offer to impose the spill over San Antonio with the push of a button. I serve this on a bed of spinach and brown rice. 1. Whisk together orange juice, maple syrup, vinegar, chipotle chile, adobo sauce, and salt in small bowl. Cover, and chill. 2. Cut each piece of tofu crosswise into 8 slices, each about 1/2-inch thick. Place tofu in large shallow glass dish. Add 1/2 cup orange juice mixture and oil to tofu, and turn to coat. Cover, and refrigerate at least 30 minutes or up to 8 hours, turning from time to time. Reserve remaining orange juice mixture, covered, in refrigerator. 3. Preheat broiler. Line large baking sheet with foil, and coat with cooking spray. Place tofu on prepared baking sheet. Combine marinade and reserved orange juice mixture in small saucepan. Bring to a simmer. Cook over medium heat 12 to 15 minutes, or until syrupy. Keep warm. 4. Broil tofu 6 to 8 minutes per side, or until golden, basting occasionally with orange juice mixture. Serve with remaining sauce.